The destruction of Phobos 20 million years from now will make a Saturn-like rings around Mars. Though, The demise of Phobos isn’t imminent, say researchers. 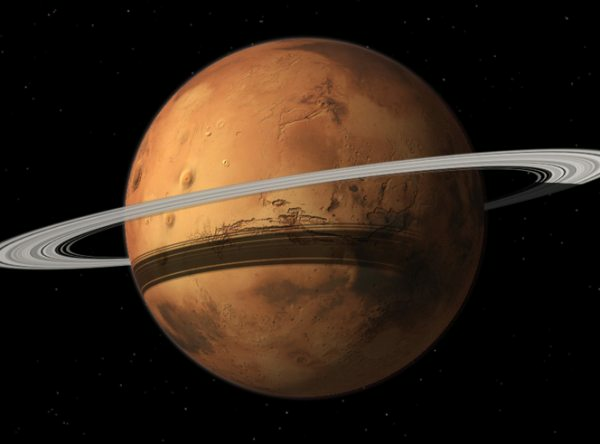 Mars is pretty cool already, I mean it’s got liquid water and everything but what may be cooler if Mars had rings like Saturn. However, like all of the other rocky planets in our solar system, it is ringless, but not for long. According to a new study by two american researchers, published this week in Nature Geoscience, Mars is probably going to have rings in its future like 20 to 40 million years in its future — on an astronomical times scale, that’s practically tomorrow. These rings will be the remnants of Phobos, the larger of Mars’s two moons. Ever since Phobos formed about four and a half billion years ago, it’s been slowly spiraling in toward Mars at a rate of about 1.8 centimeters per year, eventually it will reach the Roche limit — the point at which the pull of martian gravity will be stronger than the gravity holding Phobos together — that’s when the moon will start to fall apart. The Roche limit for Mars is about 8500 km from the planet’s center and Phobos is currently orbiting at about 9400 km meaning that the moon has less than a thousand kilometers to go before martian gravity ripped it apart, then all of the chunks of rock and dust that used to be a moon will form a ring around the planet. The reason bodies like Phobos get torn apart rather than just crashing into the planet is that the planet’s gravity doesn’t act equally on the whole moon at once. Mars’s gravity pulls harder on the near side of Phobos on the far side, that’s how you get tides on both planets and moons and you could see it happening yourself if you live anywhere near an ocean. When our moon is close, its gravity pulls at the earth hard enough for the water level to rise by several meters. Its actually makes a bulge in the water that can be seen all the way around the planet. Earth exerts a similar force on the moon and Mars exert the same kind of force on Phobos. Phobos doesn’t have water so it doesn’t have aquatic tides but it’s still under that same kind of tidal strain. It’s just that the strain acts only on the rock itself. And the Roche limit that tidal bulge will start ripping chunks of rock off the moon. So why those chunks of rock just crash into Mars instead of becoming rings? Well, some of them probably will crash into Mars pretty quickly if they’re big enough, but most of them won’t do that for a while because they’re still in orbit around the planet. Phobos orbit Mars three times in an Earth’s Day, it’s moving really fast, so the dust and rocks they get torn off will also be moving really fast. And since those pieces will be at the Roche limit as well, they’ll keep disintegrating into smaller and smaller fragments, until they’re just not heavy enough to fall inwards anymore, at least not fast. Artistic illustration of Mars having ring. The red planet could gain the rings in 40 million years when its largest moon Phobos is torn to shreds by Mars gravity. © Tushar Mittal using Celestia 2001-2010, Celestia Development Team. While our moon is moving away from earth at a few centimeters per year, Phobos is moving toward Mars at a few centimeters per year, so it is almost inevitable that it will either crash into Mars or break apart. One of our motivations for studying Phobos was as a test case to develop ideas of what processes a moon might undergo as it moves inward toward a planet. said Benjamin Black ~ one of the researchers. The martian rings will last for about a hundred million years before they are also pulled into the planet. Off course, if Phobos were a denser, harder piece of rock it would be a lot more difficult to pull it apart and it probably would crash into Mars in one catastrophic impact. But Phobos is small, only about 16 km across and its porous, it probably made of a fairly weak carbon rich rock. This new study in Nature Geoscience analyzed what we know about Phobos’s composition, orbit and the effect of Mars’ gravity, to give us the most complete model yet of how and when Mars will lose a moon and gain some Rings. To estimate the strength of Phobos and how well it will resist being pulled apart, the researchers examined the Stickney impact crater, a crater on Phobos that covers about a sixth of the moon’s surface — compared to the size of Phobos it is huge. 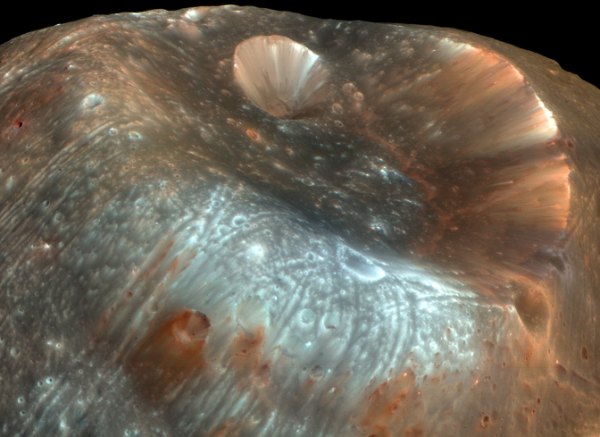 If Phobos made of rigid material, any impact strong enough to make a crater that big would have shattered it like glass. To the fact that Phobos held together tells us that it’s made of a more porous material that wouldn’t be as affected by a hard knock. The fact that it’s a weaker kind of rock actually helps, the little pockets in the porous material acted like shock padding. We’re already suspected that Phobos’s surface was full of this week carbon-rich rock because it’s dark and reflects very little light which is why we didn’t even know it was there until 1877. It’s like coal, which also has a lot of carbon — a big chunk of coal would be really hard to see in space. But, we now know that Phobos doesn’t just have carbon-rich rock on the surface it’s likely made off the same stuff all the way through. The researchers analyzed Phobos with the same models that we used to gauge rock strength for building tunnels here on Earth, and incorporating what they’ve learned about the moon’s rock strength from examining Stickney crater. Conclusion: Phobos is made of weak stuff in the middle too, which means that it should break apart fairly easily. And thus for around a hundred million years, Mars will be the most stylish rocky planet in the solar system. Standing on the surface of Mars a few tens of millions of years from now, it would be pretty spectacular to watch.